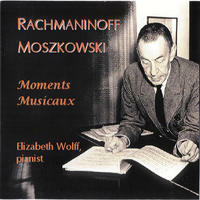 Elizabeth Wolff : Moments Musicaux. Miss Wolff's affinity for and love of the piano works of Rachmaninoff have garnered special notice. She was featured as guest soloist on New York's WQXR's "Russian Nights" special broadcast, and has concertized and conducted master classes at the renowned Rachmaninoff Institute in Tambov, Russia. She has also given recitals for the International Conference of the Rachmaninoff Society in London and Vienna as well as has reviewed new CD releases for their publication. Of Miss Wolff's own recording of the Six Moments Musicaux, Opus 16, American Record Guide noted, "I have never heard anything quite like the enchanting soft playing in No. 5, and No. 6 is a remarkable performance...a stimulating and musical pianist." This disc also features a premiere recording of both sets of Moments Musicaux (Opus 7 and 84) by Moritz Moszkowski. License 19th century classical piano by Elizabeth Wolff for your project. Play the music of Elizabeth Wolff in your restaurant or store.